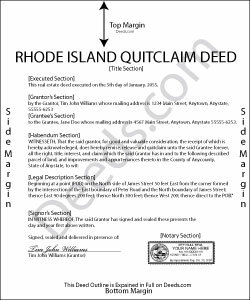 According to Title 34-11-1 of the Rhode Island General Laws, any conveyance, including a quitclaim deed, is required to be in writing and recorded; however, if it is delivered as between the parties and their heirs or those having notice of it, it is valid, binding, and sufficient to pass title even though it is not acknowledged or recorded. If a quitclaim deed is signed and delivered by the grantor, it will convey to the grantee all that the grantor is lawfully able to convey without any other act or ceremony. Once recorded and acknowledged, it is operative against third parties (34-11-4). Recording a quitclaim deed provides constructive notice of the contents (34-13-2).